Berkery Noyes Represents Gradient Analytics in the sale of its Qualitative Research Unit to Sabrient Systems - Berkery, Noyes & Co., LLC. Berkery, Noyes & Co., LLC, a leading independent investment bank serving the software, information, and professional services markets, today announces its representation of Gradient Analytics in its sale of selected assets to Sabrient Systems. Terms of the transaction were not disclosed. Founded in 1996, Gradient Analytics has emerged as a premier independent investment research provider, helping clients across the investment landscape, including hedge fund, private equity, and bulge bracket investment professionals, make more informed investment decisions. Its commitment to academically rigorous, method-driven research has allowed Gradient to rapidly distinguish itself in the emerging industry of independent investment research providers. 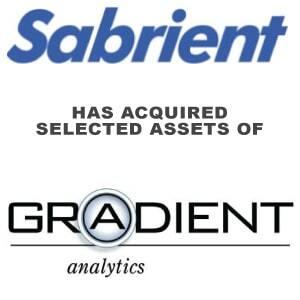 As part of the acquisition agreement, Sabrient Systems acquires a long-term commitment from co-founder Dr. Donn Vickrey, as well as all of Gradient Analytics financial analysts, sales staff, and client relationship management personnel. The purchase also includes the rights to the Gradient brand. The quantitative research business unit not acquired by Sabrient will operate under the brand Verus Analytics, and will remain dedicated to discovering new sources of intelligence and alpha for the financial markets. Aside from Dr. Vickery, Verus will retain all senior management, including President and CEO Tom Barrett and co-founder, chairman and chief scientist Dr. Carr Bettis, as well as financial and product engineers and development team members. Gradient Analytics was founded in 1996 by world-renowned academics whose work was the genesis for many of its alpha-generating quantitative factors which will continue to be offered under the Verus Analytics brand. Its predictive models, expert systems and analytical tools serve asset managers and investment advisors. Berkery Noyes provides strategic mergers and acquisitions transaction advisory services, financial consulting, and strategic research to middle-market technology, data, information, and education companies in the United States and internationally.